Thank you all for playing along with the last challenge. Winners results for #115 are published in the post below. Make sure you check back as it could be you. 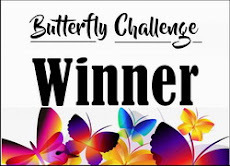 Only two of the prizes were claimed on the last challenge. Can I please ask that Winners do acknowledge their prize in the comments on the Winners post as well as emailing their details to me. This way I will know to expect an email. Please state if you are only playing for fun so that it gives someone else the chance to win. Challenge is for 2 weeks. This is the last wheel for the current challenge. 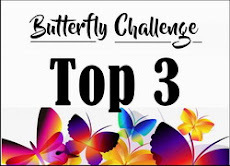 In February we will have completed 5yrs (goodness time flies when your having fun) and will be entering our 6 yr with a brand new set of wheel challenges for you to play, along with a slightly new concept. 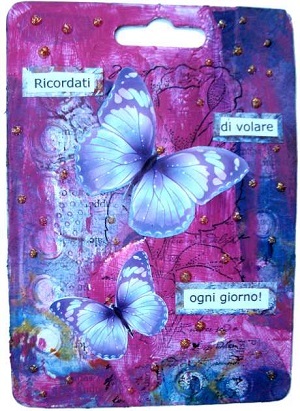 Lets Spin the Butterfly Wheel. Each challenge will be a letter of the Alphabet but there is a choice of 3 Colours and 3 Themes all beginning with the chosen letter. then you can either choose a Theme or a Colour from the wheel to be entered for the 1st Prize. you will be entered into the 2nd Prize. Please state in your post which part of the wheel you are using to play with. If you manage to use all 7 elements of the wheel then you will be entered into a 3rd Prize. #116 Spin The Butterfly Wheel with the letter K.
Kobe/Kelly Green/Kobi/Kite /Knot It /Kraft card/Butterfly. I had to use my ingenuity for this wheel and yes those colours really do exist! Please go to my blog here for how they were made. 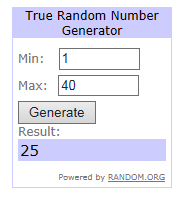 Wow, a whopping 40 entries for the last challenge. 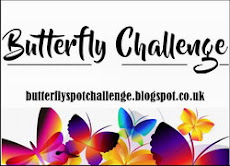 I love putting the Butterfly Challenge together but I can't play all on my own so I do thankyou so much for coming and joining in. Your input is very much appreciated. badge from the side bar. 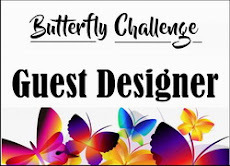 For using either one theme or one colour + your butterflies. 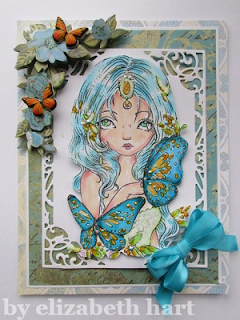 For using both a theme and a colour + your butterfly. For using all 7 elements on the wheel. Please get in touch using the email address in the sidebar to collect your prizes. Please also take the Winner's Badge from the side Bar. Uses cardstock cut to 11" x 6". This will give a finished card size of 5.5" x 6". Decide how wide you want to make the side panels. Here I have made them 1.5" which gives a middle section of 3". Mark down 1.5" on your cardstock on the short side and 1" in on the long side. continue to mark at 2" and 6.5". Repeat along the bottom. Cut slits between the 1" and 6.5". Now go back and score on the 1", 2" and 6.5" lines only down to the start of the paper. Do not score across the centre. Finally on the middle section mark 5.5" in from the left hand side and score across the middle section only. You should now have card that looks like this. I have kept this as my template. Tip. When deciding how wide to make the side panels i.e 1" 1.5" etc remember the wider that you make them that this will reduce the width of the middle section unless you first increase the card width from 6" upwards. Here I have made the card up using patterned cardstock. Uses cardstock cut to 12" x 6". 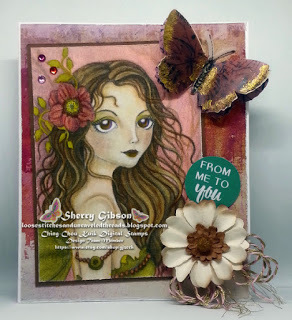 This will give a finished card size of 6" x 6". Measurements will now be (across the 12" length). Mark at 4.5", 9" 10.5" and the middle section will be scored at 6". Tip. You can also use a ready made 6" x 6" card blank opened out flat to do the measurements. 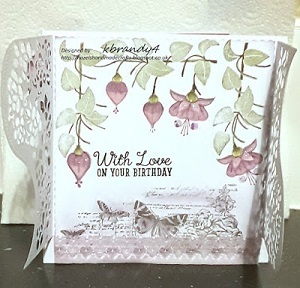 Note that if using blank card base you will have an unwanted fold on either side which can easily be covered with a strip of patterned paper cut to fit when you embellish the card. THIS IS AN INVERTED CENTRE STEP CARD. At first glance it looks like a lot of precision measuring needs to be done to achieve the desired fold. I spent a day making up models in all different sizes and have devised a method that eliminates the intricate measuring and I believe is foolproof for any size required. You can make this shape using a square card blank or cardstock cut to size. 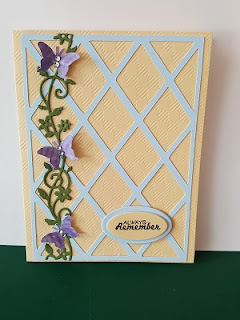 These are the meausrements for using a 5.5"sq blank card.Lay your card out flat (or if using cardstock cut to 11" x 5.5") We are using 1" for the side panels and 1" for the bottom of card when stood upright. From the left handside of card meausre down 1" on short side and then mark at 2.75" along top length. Mark again at 5.5" and lastly at 10". Repeat these measurements along the bottom. Cut between the 2.75" mark and the 10" mark, top and bottom. If you have used a card base the middle score will already be done (If using cardstock score at 5.5" down the middle of the card, longside to longside)Now go back and score the middle section only (not the 1" side panels)at the 2.75" and then at 9" and 10". Card should now look like this. If you look at the card shape sideways it will resemble the pitch of a roof.You will now see a flat piece of card (the floor) along the bottom of this picture. This is where we need to place the last fold but we are not going to do any fancy measuring. We are simply going to concertina the card flat and bring the card edges together. Lay card flat on your scor board and using a bone folder score the final fold into place. This is the finished card shape which you can now decorate as desired. Iv'e made the same card up in patterned paper as I think it is easier to see the folds. This is using a 6"sq card base. Centre fold will be at 6". The measurements along the top length of card will 3" 6" 10"and 11". This is again giving a 1" fold at base of card and 1" side panels. If you look at the reverse side of the card this is what you will now see. Bring the two clips down together at the base of the card. Use you bone folder to create the last fold. Here you can see the two sizes side by side. 5.5" in white and 6" in the pattern. Tip. These measurements will work for all sizes of sq cards as long as you remember that the first score line on the left (which is also the first mark for cutting ) must always be half of the folded sq. or 1 qtr of the length of the carstock laid out flat. ie. for a 5.5" sq it will be 2.75"
6" sq it will be 3"
6.5" sq it will be 3.25"
7" sq it will be 3.5"
7.5" sq it will be 3.75"
8" sq it will be 4"
You can vary the width of the side panels but keep the base to 1" for the smaller sizes. #115 Spin The Butterfly Wheel with the Letter Y. Thank you all for playing along with the last challenge. 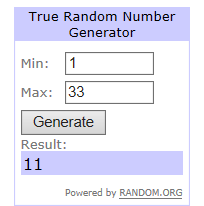 Winners results for #114 are published in the post below. Make sure you check back as it could be you. Can I please ask that Winners do acknowledge their prize in the comments on the Winners post as well as emailing their details to me. This way I will know to expect an email. Please state if you are only playing for fun so that it gives someone else the chance to win. Challenge is for 2 weeks. Just a few more spins of the current wheel left to do and then a New Challenge Wheel will start in February when the challenge will be entering it's Sixth Year. Each challenge will still be a letter of the Alphabet but there will now be a choice of 3 Colours and 3 Themes all beginning with the chosen letter. Yale Blue/Yew/Yellow/Your Choice/Yarn /You, in the sentiment/Butterfly. I have used Wikipedia's excellent site for obtaining most of the colours chosen for the wheels. I then went through all my Promarkers, Marvey le PlumeII, Graph'it and Spectrum Noir pens to find the nearest colour match for me to use. My first card uses all Seven elements. Uses two matching blank card bases. On this example I have used cards that are 5" square. Place cards side by side with the open edges together. Tip 1. Remove a slither of card on the back page of 1st card. This will enable the cards to fit together . 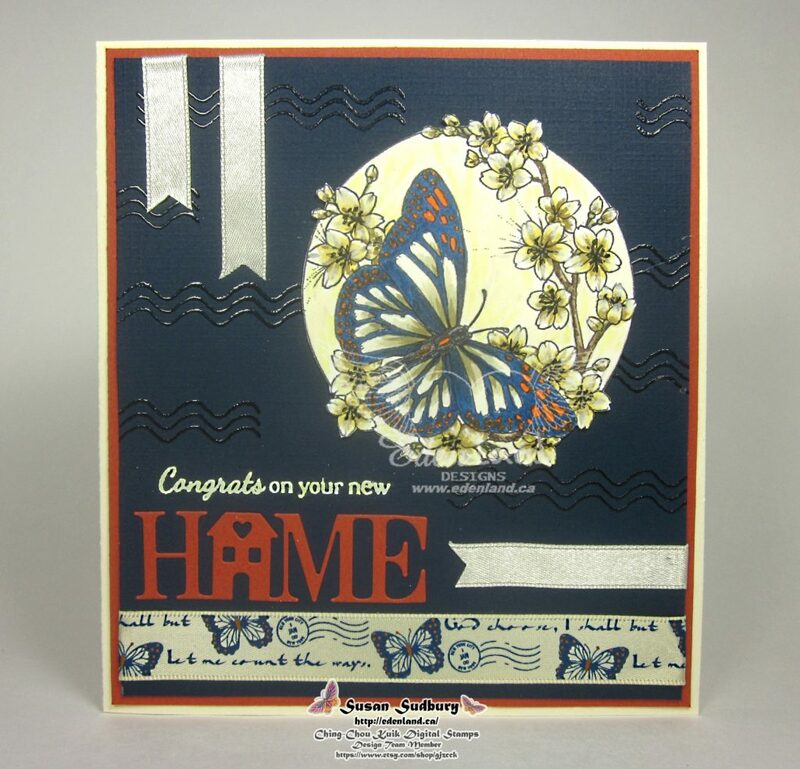 Add ds tape to the front of the second card and then adhere the two cards together . This will make a strip of card that is 15" long. Score at 2.5" and 12.5". This will then fold to make a card base of 5" square. Mark 2" down from the top of each outside edge and draw a diagonal line up to the first and last fold. Trim these two pieces off and discard. You can now go ahead and decorate your card as desired. Uses 12"square design paper. Trim down to 6" x12". Score at 2", 4", 8" and 10". Mark 3" down from the top of each outside edge and draw a diagonal line up to the second and third fold lines. Trim these pieces off but this time keep. Cut them at the 2" crease line on both pieces. Adhere to the base card as shown. you can now decorate as required. Uses full scape paper 8.25" x 11.75". Trim down to 5.5" x11.5". Score at 1.75", 3.5", 7" and 8.75". Tip 1. I printed a digidesign paper onto my full scape paper before trimming to size. Mark 2.75" down from the top of each outside edge and draw a diagonal line up to the first and last fold lines. Cut these pieces off and use to trim the bottom of the card as shown below. Card base will look like this when closed. Tip 1. Make a belly band to hold card shut. #114 Spin The Wheel with the Letter I.